A largish theropod form the late Jurassic of China. 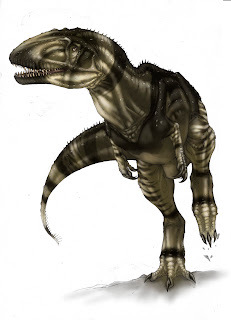 It's now stipulated that this animal is the precursor of the carcharadontosaur line. Your art is great, as always. I am curious about how do you manage to get this much up-to-date information on dinosaurs. Is there a source of information that you would suggest? I would like to learn too. What an interesting head shape, I really like the coloring on this one too.